You’re sitting on a lot of data. What should you do with it? Do you produce reports and provide analytics in the hopes that people will make data-driven decisions? Sounds like a good idea but the reality is that this may be easier said than done. True “data-driven decision making” assumes firstly that people are looking at all the charts & graphs you give them. The second assumption is that if they do the first step, that users will understand the analytics they are looking at and will know what they are meant to do differently to improve in the future. Take the topic of Performance Management and its impact on Career Development. Think of all the metrics you would need to provide a manager for them to understand historically what has been the performance history of people in their team, what are the promotion rates overall and then of minorities? What is the upgrade or downgrade rate? Then there are the tactical questions like who went on maternity leave this year? Who hasn’t been promoted in a while? There are so many data points that would need to be provided; it would overwhelm the manager and they would likely go back to doing what they have always done. But the performance management process is obviously an important one. Decisions made about someone’s performance can have lasting effects on their career and any missteps can lead to unhappy employees leaving your organisation. While the evaluation and measured contributions are ultimately a human decision, technology is frequently used to manage the process. So why isn’t technology structured in a way that helps ensure the best decisions are being made? Instead of providing more analytics & reporting, why can’t we turn data into instant action? With increasing manager discretion and self-service, how can we ensure managers, who don’t have time (or sometimes ability) to consume analytics, know about their blind spots? How can we teach them to double check their assumptions and challenge their unconscious biases? Whilst these decisions can detrimentally impact any employee’s career, research shows that especially underrepresented groups, like women, racial minorities, and differently abled individuals are especially susceptible to having their careers impacted by unconscious bias in the performance management and calibration processes. A new feature aims to subtly, but intentionally, address just that. One of the key product strategies behind Business Beyond Bias at SAP SuccessFactors, is that measurement is not enough, instead how we can embed inclusion into day to day HCM practices to result in better decision making proactively? When it comes to performance & career development decisions, the SAP SuccessFactors Calibration session is the perfect place for this as Managers & their HR Business Partners are already gathering to discuss employee performance. One thing the Calibration Session has not historically surfaced is all the factors we don’t realize that can lead to those ratings. That problem is about to become a thing of the past. For example, research shows that maternity leave tends to have a negative impact on a woman’s career. 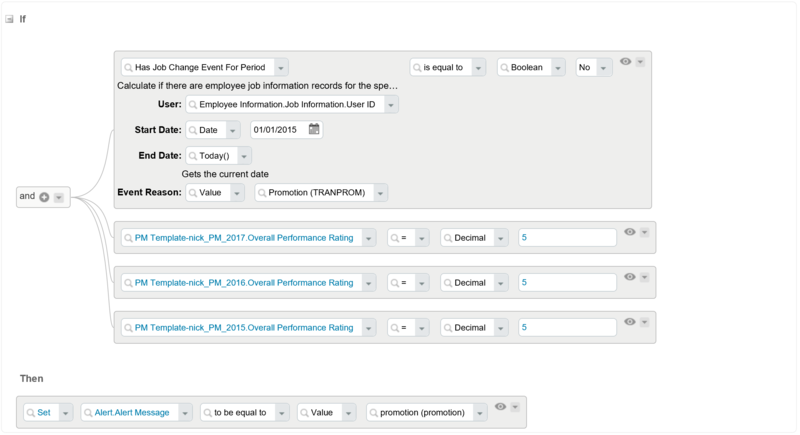 SAP SuccessFactors now prompts the manager with questions that challenge these status quo types of issues. Using augmented intelligence to nudge at the unconscious biases of people managers and HR, the system automatically raises up questions about low-rated employees who have gone on maternity leave recently. Questions raised by the system extend to identifying previous high performers from certain groups who were significantly downgraded in assessments or roles, or consistent high performers that appear to have been overlooked for a promotion. These are all important discussion points that should happen between the Manger & HRBP but rarely do. Without technology to nudge at unconscious biases, antiquated practices that include datapoints not relevant to people decisions continue to prevail undetected and unchallenged. 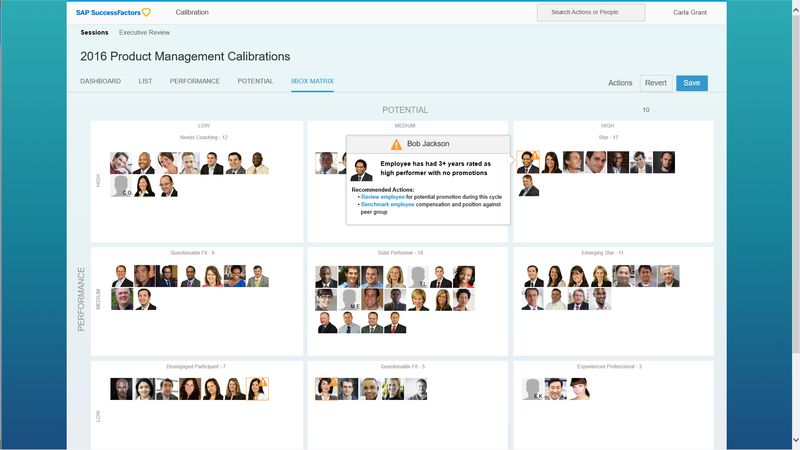 The new feature in SAP SuccessFactors Calibration for SAP SuccessFactors Employee Central customers can now detect these scenarios and nudge the manager to verify their decision, all based on configurable rules to suit your organisation. The Q4 2017 Release will focus on three main scenarios; however, the Rules Engine framework is flexible enough that you can be quite creative with the rules to suit your organization. 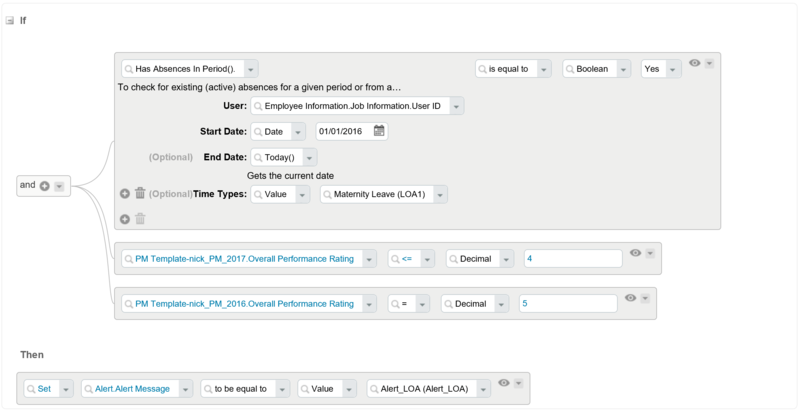 Employee Information Object: this is where you can filter your rules for specific demographic groups to line up with your organization objectives (eg. Gender, Age, Ethnicity) and any country specific data you are capturing. The first scenario is aimed at detecting those that are possibly being overlooked for a promotion. 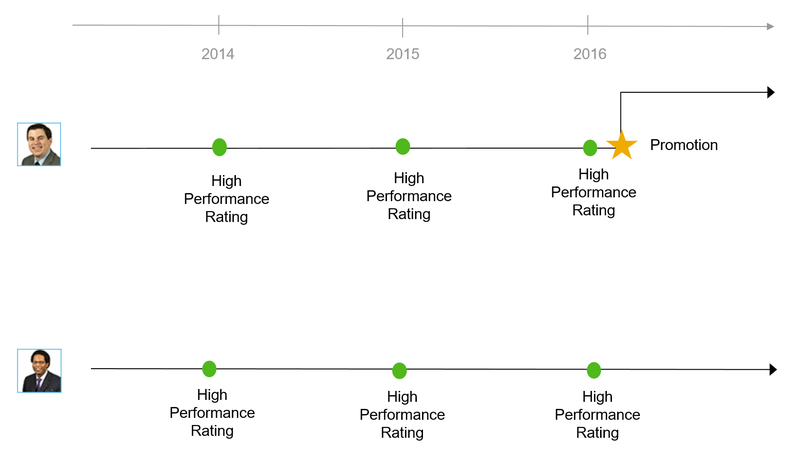 In the example below, it is typical for this organisation that they promote every 3 years and you can see the first employee has been awarded a promotion after consistent high performance. Whereas the second employee, who has had the same history, has not been awarded a promotion. This type of rule can be built to detect anyone in the organization or filtered for employees who belong to specific demographic groups. The third scenario is a simple reduction in performance. For this type of rule, you can configure it for any reduction (eg. High to Med) or specifically for dramatic reductions, eg. High to Low. You may also wish to filter this rule for specific demographics if you are targeting certain diversity initiatives or leave it open to flag anyone who appears to be a consistent high performer and now for the first time ever has been rated low. Once built, rules are then applied per Calibration template, so you can control which rules should appear in different Calibration Sessions, allowing for flexibility across different teams or regions. For more details on the pre-requisites and how to enable this feature, please see the Calibration Guide on the SAP Help Portal or check out STE-576 in the Q4 Release notes. For more details on how SAP SuccessFactors technology can help your Business Beyond Bias please see the new eBook.